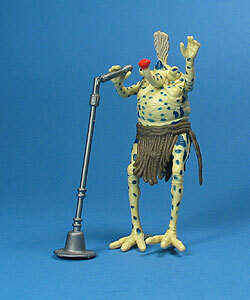 This figure was packaged along with Max Rebo and Droopy McCool in the Sy Snootles and the Rebo Band three pack. The set was package in a Return Of The Jedi 65 back shadow box in Canada and the United States and in a Tri ?logo 70 back box in Europe. Comments: Arguably, what very little Sy Snootles wore was based heavily on the Art Deco inspired fashions of the 1930?s. Sadly, with her gangly shape, she wasn?t ever really much of a pin up girl for one of the most interesting points of human art. To her advantage her ability to wail like Yoko Ono and her stage presence that is disturbingly similar to that of Tina Turner, made her oddly popular in a galaxy far, far away? but only as a one hit wonder. Even her so-called comeback in 1997 failed to help the diva get a glimpse of the fame she once had in 1983. Major Variations: Though all vintage figures have minor variations, the Sy Snootles action figure itself has no known variations. There is however a major mould variation with the Microphone Stand accessory packed in with the set this figure comes from. Each of the accessories packed in the Sy Snootles and the Rebo Band three pack has a mould (or in the case of the organ, a spray op) variation. Each of the accessories (save the organ) was moulded in both black and gray plastics. 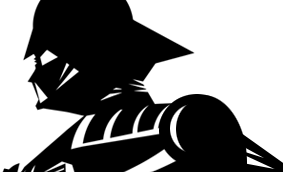 Every known example shows that the Black Moulded Musical Instrument was exclusively packed with the Gray Moulded Microphone Stand and Music Stand, while the Gray Moulded Musical Instrument was exclusively packed with the Black Moulded Microphone Stand and Music Stand. The organ was produced with both bronze and gold spray ops. There is no indication that either version of the organ was packed exclusively with either of the accessories mould variations. There are no documented examples of all black or all gray accessories being packed together. Text & Photography by D. Martin Myatt. FS Gentle Giant 2017 PGM Darth Revan Statue!